Western students of mythology are often surprised to find that, besides power and prosperity, the elephant symbolizes clouds and gracefulness. In a cave at Bhaja not far from Mumbai [formerly, Bombay] that was the site of a Buddhist monastery around 200 BCE, there is a stone relief carving showing Indra, king of the gods. He is seated upon Airavata [or Ayravata] his elephant. This Divine Elephant is thought of as the progenitor of all earthly elephants and is understood as the embodiment of the huge clouds pregnant with the monsoon rains. In a Hindu scripture called the Hastyayurveda [Skt. hastya is elephant] there is the description of an ancient yearly rain festival celebrating the Lotus goddess, Lakshmi. An elephant was painted white with sandalwood paste, decorated with flowers and paraded through the town. Transvestite clowns accompanied it, and there was music and joking of a sexual nature. The highlight was the worship of the elephant by the king, his ministers and generals. This Veda says that if the ritual is not performed, the fortune and prosperity that is associated with the elephant will vanish. 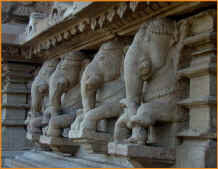 This Divine Elephant is referred to in prayer as Shri-Gaja, Lady Laxmi's Elephant, or Megha [cloud]. It is believed that when this divine animal is duly invoked, it can conjure the winged elephants --the clouds of the atmosphere -- to visit the earth bearing the accompanying rainfalls. Indra's mount was the first elephant to emerge from the Garuda's egg. Brahma had held the pieces of shell in his hands while singing seven hymns and, led by Ayravana, 16 elephants manifested. The 8 females, the caryatids or supports of the world at each of the points of the compass are named: Pundarika, Vamana, Kumudu, Anjana, Pushpadanta, Sarvabhauma, Supratika and Aparanta. It is said that once elephants had wings. One day one was flying over a very large old banyan tree somewhere to the north of the Himalayas. Wishing to rest for awhile, it settled upon one of the uppermost branches. But the branch could not support the weight of the animal and it cracked and fell upon a meditating hermit sitting below. This yogi, whose name was Dirghatapas, lost his temper and cursed away the wings of the poor beast. From that day to this, elephants have had to walk. The elephant's movements are considered the epitome of gracefulness. However, the elephant also represents the earth and its tremors. Once, in India, the ground used top actually tremble as the herds passed. A regional myth holds that the world rests on the head of a great elephant, Mahapadma, and when it moves its head to get more comfortable, an earthquake is produced. When, Hindu mythology recounts, at the beginning of Time the Goddess Durga did battle with the embodiment of Evil, that demon took the form of a buffalo but each time She struck it, it transformed. At one point, it assumed the form of a great elephant. In a version of the myth, Lord Shiva induced this beast, Gajashura, to dance with him until it could endure no longer and finally, it fell down dead. Then Shiva flayed the monster and donned the dripping skin as his mantle. In this bloody garment, he performed his terrifying Tandava victory dance that shook the foundations of the three worlds. Therefore, as a garment it stands for the removal of arrogance, pride or vanity. Similarly, the newly flayed skin of an elephant comprises the upper-body garment of Buddhist herukas, such as the bodhisattva Vajrapani and other wrathful deities that are visualized in Tibetan Buddhist tantric practice. When the apostle Mahinda went to Shri Lanka [formerly, Ceylon] in the 3rd century BCE, he preached the Buddha's teachings to King Devanampiyatissa choosing for this occasion, the Chula-hatthi-padopama Sutta [Parable of the Elephant's Footprint]. It was originally given by the Buddha at Savatthi [Shravasti] when the brahmin, Janussoni, asked the wandering ascetic Pilotika whether he knew all the virtues and accomplishments of the Buddha. The ascetic replied that only a Buddha matching another Buddha in attainment could know all the virtues of the other. Ordinary people could only use their imagination, just as a hunter judges the dimensions of an elephant from the size of its footprints. Later Janussoni went to see the Buddha who told him that the size of an elephant's footprint might still be misleading. Only when one followed the spoor and found the animal grazing in the open could its true size be judged. So the virtues of the Buddha and his Teaching could be fully appreciated and understood only when one follows the Teaching and practises as taught by him until the final goal is achieved. Another scripture concerning this simile is the Maha-hatthi-padopama Sutta which was given by one of Buddha's immediate disciples, Venerable Sariputta [Shariputra,] to the bhikshus at Shravasti. He explained that just as the footprint of all animals could be contained within the footprint of an elephant, all wholesome dharmas were comprised in the Four Noble Truths. One of the Seven Jewels of Royal Power, the elephant stands for the boundless powers of a Buddha: miraculous aspiration, analysis, intention, and effort. Mayadevi, wife of King Shudhodana, had an auspicious dream. A young white elephant holding a lotus flower in its trunk entered her body by her right side. The dream was interpreted to mean that she had conceived a son. "In the deva realm, Bodhisattva Dampa-tog-karpo gave his crown to Maitreya, in preparation to his descending to earth. He then emanated himself as a white elephant. As his mother, Gyutrulma, lay sleeping she had a dream that a white elephant, shining with a glorious light, was within her womb and she flew through the sky and climbed mountains. Many kings and ministers bowed and prostrated to her; it was at that time that the Buddha entered her womb," according to the Tibetan version of the Incarnation. One of the earlier lives of the Buddha as recounted in the Chaddanta Jataka appears engraved on a stupa at Barhud, India. Depicted is the unusual elephant with six tusks who was the leader of a herd. The Theravada tradition tells us that when Gautama practiced austerities alone in the Paraleyya wilderness, it was an elephant that provided him with food and shelter. Later, as a demonstration of the Buddha's enlightened state, the mad elephant Nilagiri ("midnight-blue mountain") charged furiously at the Buddha and was pacified. Then the animal was seen to prostrate himself before the Master, frustrating the murderous ambition of his envious cousin, Devatta. Tara protects against Kuni, a charging elephant. Occasionally in the tantric yoga system, an elephant is represented at the muladhara or foundation chakra. According to Rawson, it represents the input of all the senses which can be transformed by the activity of the higher chakras. In Mahayana Buddhism, where the focus is on bodhicitta rather than on kundalini, we can see how the taming of Nalagiri may represent a transformation of ordinary awareness into bodhisattva nature. Taming the wild elephant of our mind by means of Mahamudra. The instrument of control is called in Sanskrit, ankhusha. In English, it is an ankh. At Indian Parenting, read the Jataka retold for children, The White Elephant. An elephant is the only means of transport deemed fitting for the annual Danta-dhatu (Tooth Relic) procession, Esala Perahera, in Kandy, Sri Lanka. The animal is chosen because of its legendary grace, its prestige as a royal and military mount, as well as its connection with the gods and the legends of the Buddha. The actual relic has not been paraded in this way since 1848, however. The vehicle or mount of Akshobya is a pair of elephants. He is the primordial Buddha associated with vijnana (consciousness) sometimes described as "space." He originates from the blue syllable Hum. Two-armed and one-faced, he sits in the vajraparyanka pose making the bhusparsha (earth-touching) mudra. When represented on a stupa or mandala, he faces east. His symbol is the vajra or thunderbolt. His consort or shakti is Lochana. Gregory Colbert, Ashes and Snow exhibit. Manjushri (Tib. Jampalyang) is sometimes described as seated on an elephant while raising his sword of discriminating wisdom in his right hand. The famous parable of 5 blind men arguing about an elephant. Katsushika Hokusai (1760-1849): The painting of a long-suffering elephant undergoing the above experience. Visit Elephant, part two and meet Ganesh. Ayravata: Yes, there is a link between the English word air and the ancient Avestan [Persian] and Vedic Sanskrit arya. In fact, the name of Greek goddess Artemis is also linked. Thanks to Michael Cross, mcc@caltech.edu photo of Lakshman temple, Khajuraho. 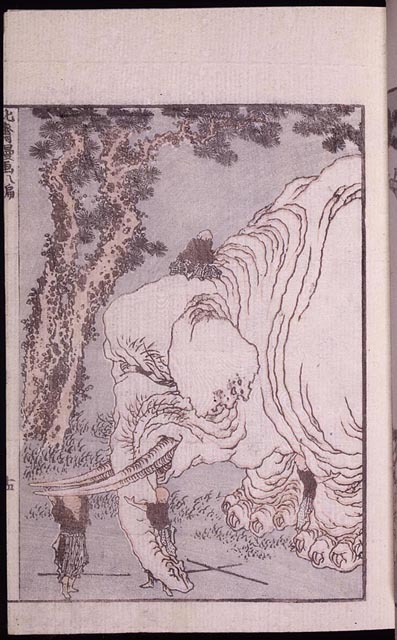 Illustration of Maya's dream of a small elephant is from a tangka at Tibet Shop.